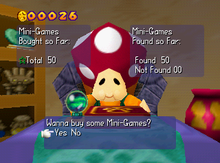 Puff is a Toad that lives in the Mushroom Village and makes her first and only appearance in Mario Party. She lives in the Mini-Game House and is always sitting at a table with a crystal ball on it. Looking into the Crystal Ball will allow the players to play minigames they have played on adventure boards. 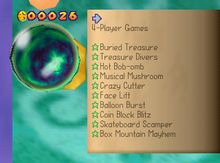 Going into the vase to the right of Puff allows the players to play Pot O' Skills, a Trial Mode held at the Mini-Game Stadium that is replaced by Mini-Game Trial in Mario Party 2, where Puff watches the players through her crystal ball. This page was last edited on July 18, 2018, at 22:38.